Grab your sun hats – Camberwell Arts Festival 2016 is almost here! Oh, we are so excited here at Flux Jewellery School; the sun is shining and our vitamin D dose is topped up and raising the mood, all in time for our Camberwell Arts Festival 2016 Open Studios events. When we open our studio doors to the public this summer you’ll find it’s all (well almost) about Flux students this time as we celebrate their enormous talent and their diverse creativity. Getting Creative –An exhibition of jewellery by students at Flux. Drop in to the studio to see our jewellery students in action. Watch them transform their materials into amazing jewels, ask them about our ancient techniques. 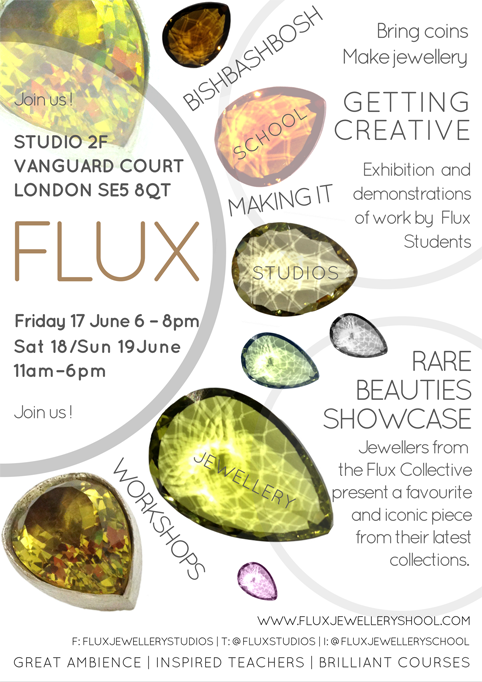 Find out about courses and workshops we run here at Flux Jewellery School. Back by popular demand, we are offering you, the public, an opportunity to turn your coppers into ‘Top Brass’. Dig out your favourite old coin from pre-Euro Europe or other distant places; bring it down to Flux Studios and we’ll help you transform it into a 3D wearable pendant that will give it new life and true currency! Friday 17June 6.30pm – 8pm – We’ll be here 6.30-8pm. Of course, as well as being a Jewellery School, we are also a Jewellery Studio: Flux Studios is home to a membership-based collective of professional jewellers who work together to share knowledge and skills, and to develop their independent jewellery businesses. We make collections for sale and we also work to commission. Some of us will be at the studio to oversee the fun for our Open Studios events, We’ll also have a carefully selected showcase of jewellery on show and if you’re interested in our work you’ll have an opportunity to ask us more about how to purchase or commission work. Jewellers from the Flux Collective present a favourite and iconic piece from their latest jewellery collections. Explore our diverse and inspiring range of jewellery styles. We’ll be here to talk with you about our jewellery and how we work. Tagged BishBashBosh, Camberwell Arts Festival, Getting Creative, Making It, Open Studios, Rare Beauties. Bookmark the permalink.